A spin is an uncoordinated stall. The recognition and avoidance of the condition which could lead to a spin. The correct recovery action to be taken. A spin can occurs during stall and a stall can occur in slow flight, thus it’s really important to know how to recognize it, how to avoid it, and how to recover it. A lot of fatal accidents are caused by a spin. When setting up for a stall entry, why is it necessary to maintain wing level and the ball centered ? In a climbing turn, which wing should stall first ? Why is aileron not used to control a wing drop when a stall is imminent ? Airplane must be stalled before a spin can occur. 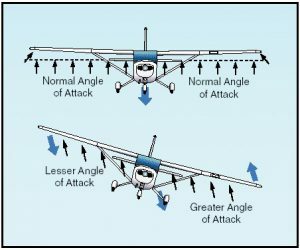 If one wing of an aircraft produces more lift than the other, the aircraft will roll and the downgoing wing will meet the relative airflow a at greater angle of attack. The downgoing wing becomes more stalled, produces less lift and automatically continues to drop. The upgoing wing, because of its relative upward motion, meets the airflow at a reduced A of A, becomes less stalled and produces more lift, which accentuates the roll. 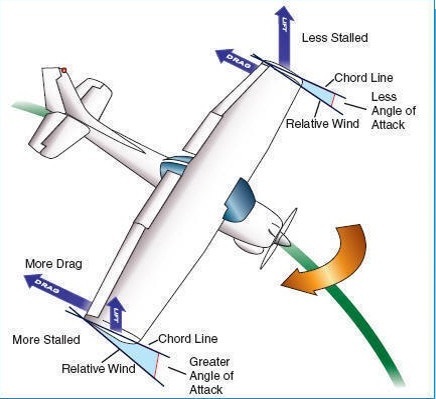 A number of aircraft have the tendency to drop a wing or roll at the stall which could result into a spin if left unattended. The incipient stage is from the time the airplane stalls and rotation starts until the spin has fully developed. This change may take up to two turns for most airplanes. Incipient spins that are not allowed to develop into a steady-state spin are the most commonly used in the introduction to spin training and recovery techniques. The incipient spin recovery procedure should be commenced prior to the completion of 360° of rotation. In the developed stage, a state of equilibrium is reached, characterized by a low and constant airspeed. The flight path is nearly vertical and rates of descent will be as high as 5000 to 8000 feet per minute. At this stage the spin will be self-perpetuating. If the pilot does nothing about it, the spin is likely to continue until the aircraft hits the ground. 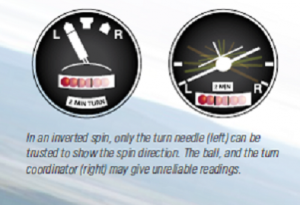 Positive anti-spin control inputs will be required to recover from the fully developed spin. Control inputs are initiated to breakout of spin and return to normal flight. Not all aircrafts are approved for spin training. The type certificate, AFM (POH), or cockpit placards must be checked. Power idle (may need rpm check POH). Aileron neutral (don’t use aileron in stall and spin !!!). When the Stall warning horn: full rudder in the direction which has been choose for the spin. Maintain back pressure (may enter a spiral dive inadvertently during entry if sufficient back pressure is not held- check airspeed !!!). Turn Coordinator – needle to side of spin, ball unreliable. Forward pressure to stop the stall. Apply and hold full rudder opposite to the direction of rotation. Hold these control inputs until rotation stops. Recover smoothly from the resulting dive. Add power when nose is established above the horizon. The aircraft is already vulnerable by being at low speed and in a nose-up attitude and therefore close to the stall. Low-energy, low-powered aeroplanes in this situation will suffer some performance loss during a turn. If this is not compensated for by lowering the nose, the speed will further diminish. 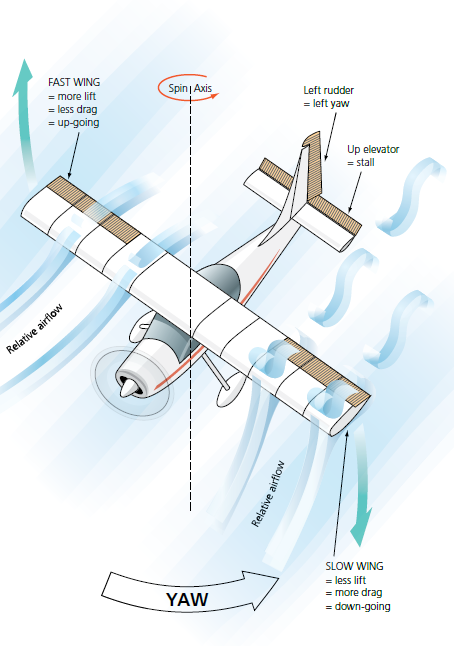 Turning – or even the application of aileron may give the required yaw to precipitate the spin. In a high nose-up attitude, with high power and low speed, the immediate priority is to lower the nose and preserve existing airspeed. In most cases, there is little option but to land ahead. Attempting a turn back to the runway or to a limited selection of landing areas will provide the G loading to increase the stall speed. Any yaw will now put the aeroplane into the incipient spin situation. Flying in hilly terrain may distort the visual cues needed to ascertain both the pitch and roll attitudes of the aircraft. It is easy to allow airspeed to reduce further than anticipated. When combined with a turn, particularly in confined areas, this can produce stall and yaw, the two components needed for a spin. 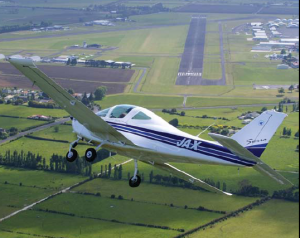 Consider a late turn from base leg to final, overturning the centre line, particularly on a glide or forced-landing approach, or in a crosswind. If any attempt is made to correct the situation by increasing rudder in the direction of the turn without increasing bank, this coupled with a reducing or low airspeed will result in a skidding turn, and will provide all the ingredients needed to start a spin. The low altitude will preclude the chance of recovery. The effect of leaving power-on during a spin is to lengthen recoveries on some aircraft. 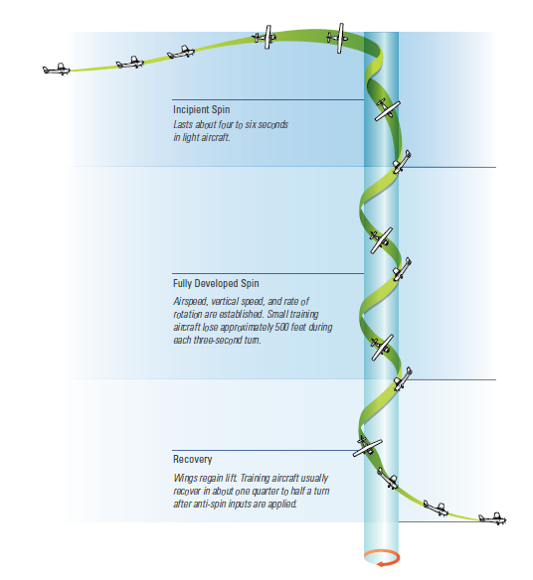 Additionally a power-on recovery will likely result in increased airspeed and height loss during the dive recovery. Distribution of the weight can have a significant effect on spin behaviour. It’ changes the place of center of gravity. Forward location of the centre of gravity will usually make it more difficult to obtain a pure spin, due to the reduced elevator effectiveness but easy to recover. The farther back the centre of gravity the stall and spin entry will be easy and the recovery more difficult. Prolong the spin, because it induces a flatter spin attitude and lower spin rate. Incur damage from high speed or high loading, or both, in recovery from the dive. High altitude will tend to lengthen recoveries since the less dense air provides less controls to oppose the spin. However that does not suggest you should use low altitude for spin practice. Disorientation occurs when there is a conflict between the visual and vestibular sensations – your eyes tell you one thing, but your inner ear says something else. During the initial stages of a spin, the eye is able to remain oriented. However, in a spin that continues beyond two turns, disorientation can occurs and it can be very difficult for the pilot to make the correct recovery inputs, unless properly trained and experienced in spinning. After about five turns, the eye becomes out of synch with the aeroplane rotation. Vision will blur and the speed of rotation appears to increase. Now the pilot has difficulty in determining the number of turns in the spin, its direction, and the effectiveness of any actions taken to exit the spin. Upon stopping a spin, the fluid within the semicircular canals continues to move in the same direction as the spin rotation. The brain must contend with a conflict between this indication of turning one way and a visual indication of turning in the opposite direction, when there may be no actual rotation at all. What’s the difference between spin and stall? How you would recover from a spin? What is happening if the airspeed is Increasing? What’s the most common cause of entry to an unintentional spin ? Why would you not use ailerons to level the wings?